memory and executes it. A CPU is often likened to the "brain" of a computer. to the CPU, travels across the system's bus. forgets everything it holds when the power is turned off. remembered even when the power is turned off. whereas hard disks are not. Hard disks can hold a lot more information than floppy disks. These allow digitally published information on a compact disc to be read by the computer. operating system can read as if it were on a hard disk drive. monitors are rare in newer computer systems. on-board processors to decrease the load on the system processor. the first six letters on the upper left-hand side of the keyboard. have radio or infrared connections that make the tail unnecessary. only, whereas others may print graphics. These are generally used for making backup copies of information stored on disks. They are slower than disks but store large amounts of data in a fairly cheap way. A modem allows you to communicate with other computers across a telephone line. for errors that are caused by a poor telephone connection. 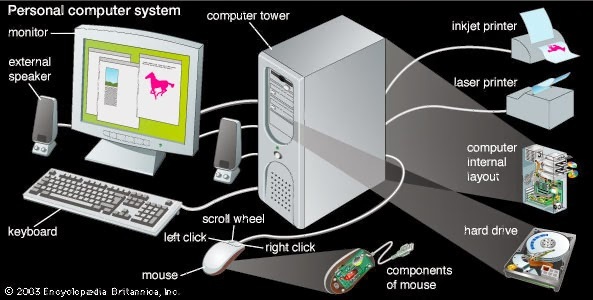 computers across a high-speed link. voice recognition cards, and synthesizers to name a few.